As well as adding a custom logo to your PDF cover page, with a Plus or Team account, you also have the option to add it in the footer. If you currently have a Free plan but would like to export your storyboards as PDF files, you can upgrade here. When you click Export on your storyboard, you'll be taken to the storyboard export page. 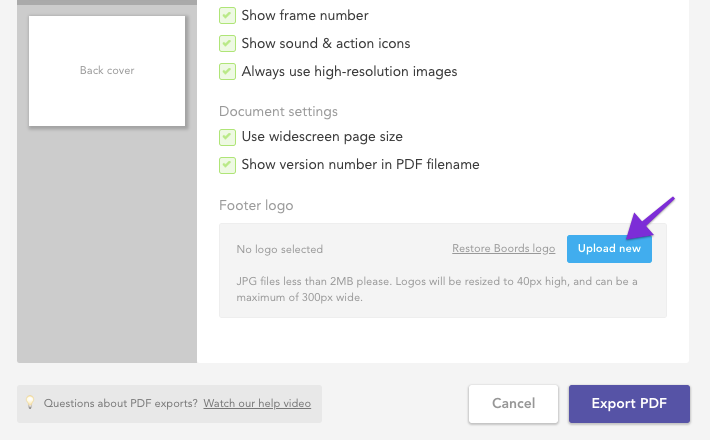 In the "Footer logo" section, upload your logo and it will be added to the bottom right-hand corner of your exported PDF. JPG files less than 2MB can be added and will always be resized to 40px high and a maximum of 300px wide. If you'd rather not have any logo on your PDF, you can easily remove the default Boords logo by clicking "Remove Existing".